Goalkeeper Richard Lee was Brentford's hero as they beat Leyton Orient on penalties to progress in the Johnstone's Paint Trophy. Brentford had the better of a poor first half, with Nicky Forster shooting wide and heading at keeper Lee Butcher. Orient improved after the break as Matthew Spring, Jimmy Smith and Jonathan Tehoue all went close. Spot-kicks were needed and, after nine were scored, Lee saved from Spring to send Brentford through. 95:56 A save by Richard Lee from penalty by Matthew Spring. 95:22 Craig Woodman scores a penalty. Leyton Orient 4-5 Brentford on penalties. 94:55 Charlie Daniels scores a penalty. Leyton Orient 4-4 Brentford on penalties. 94:26 Gary Alexander scores a penalty. Leyton Orient 3-4 Brentford on penalties. 93:48 Ben Chorley scores a penalty. Leyton Orient 3-3 Brentford on penalties. 93:12 Sam Saunders scores a penalty. Leyton Orient 2-3 Brentford on penalties. 92:34 Elliot Omozusi scores a penalty. Leyton Orient 2-2 Brentford on penalties. 92:01 Penalty scored by David Hunt. Leyton Orient 1-2 Brentford on penalties. 91:19 Penalty scored by Stephen Dawson. Leyton Orient 1-1 Brentford on penalties. 91:02 Penalty scored by Nicky Forster. 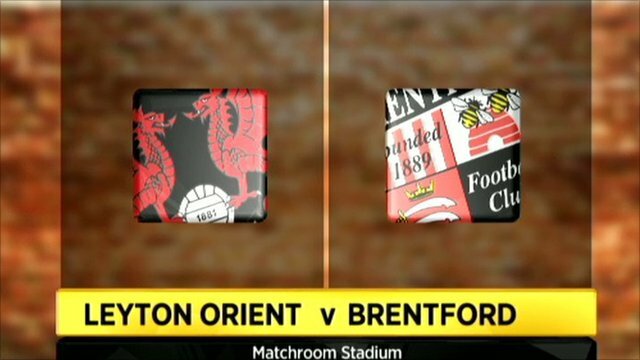 Leyton Orient 0-1 Brentford on penalties. 90:00+8:58 The players are ready for the drama of the penalty shoot-out. 90:00+4:22 The referee brings to match to an end, it's all square and we move straight to a penalty shoot-out to decide the winners. 90:00+3:09 Charlie Daniels produces a cross, brilliant save by Richard Lee. 90:00+1:39 Shot by Jonathan Tehoue from deep inside the penalty area misses wide to the left of the target. 90:00+0:13 The ball is swung over by Dean Cox, David McCracken manages to make a clearance. 89:57 The ball is delivered by Charlie Daniels. 89:04 The ball is swung over by Dean Cox, Richard Lee makes a save. 87:28 The ball is delivered by Dean Cox, save made by Richard Lee. 86:16 Inswinging corner taken left-footed by Sam Wood. 86:16 Substitution Charlie Daniels replaces Paul-Jose M'Poku. 84:17 Free kick awarded for an unfair challenge on Aaron Brown by Nicky Forster. Aaron Brown restarts play with the free kick. 83:44 Dean Cox delivers the ball, Headed effort on goal by Matthew Spring from inside the penalty box misses to the right of the goal. 83:18 Sam Saunders sends in a cross, clearance made by Aaron Brown. 82:47 The offside flag is raised against Gary Alexander. Lee Butcher restarts play with the free kick. 82:28 Substitution Dean Cox is brought on as a substitute for Jimmy Smith. 78:45 The ball is swung over by David Hunt. 77:45 Handball decision goes against Sam Saunders. Lee Butcher takes the free kick. 77:04 Substitution Sam Saunders on for Toumani Diagouraga. 76:41 The ball is sent over by Elliot Omozusi, save by Richard Lee. 76:09 Pim Balkestein produces a cross, Lee Butcher makes a save. 74:57 Jonathan Tehoue has an effort at goal from outside the area which misses left. 73:53 Sam Wood has an effort at goal from outside the penalty box which goes wide right of the target. 73:01 Jonathan Tehoue is flagged offside by the assistant referee. Indirect free kick taken by Richard Lee. Correction - 72:06 Foul by Sam Wood on Matthew Spring, free kick awarded. Direct free kick taken by Ben Chorley. 72:06 Foul by Sam Wood on Matthew Spring, free kick awarded. Free kick taken by Ben Chorley. 72:06 Booking Sam Wood booked. 70:38 Outswinging corner taken from the right by-line by Paul-Jose M'Poku, clearance by Leon Legge. 69:52 Substitution Jonathan Tehoue comes on in place of Ryan Jarvis. 69:42 Shot from long distance by Paul-Jose M'Poku misses to the right of the target. 68:10 Free kick awarded for a foul by Sam Wood on Paul-Jose M'Poku. Paul-Jose M'Poku produces a shot on goal direct from the free kick. 67:13 The ball is delivered by Nicky Forster, Elliot Omozusi manages to make a clearance. 66:25 David Hunt sends in a cross, Aaron Brown manages to make a clearance. 65:37 Inswinging corner taken right-footed by Paul-Jose M'Poku, clearance made by Pim Balkestein. Correction - 65:23 Shot from 18 yards by Jimmy Smith. Save by Lee Butcher. 65:23 Shot by Toumani Diagouraga. Save made by Lee Butcher. 64:45 Pim Balkestein concedes a free kick for a foul on Ryan Jarvis. Direct free kick taken by Elliot Omozusi. 64:01 Kirk Hudson produces a cross. 63:30 Unfair challenge on Leon Legge by Ryan Jarvis results in a free kick. David Hunt takes the free kick. 62:41 Pim Balkestein sends in a cross, clearance by Terrell Forbes. 59:50 The referee penalises Gary Alexander for handball. Ben Chorley restarts play with the free kick. 58:37 Substitution David Hunt comes on in place of Marcus Bean. 58:37 Substitution Kirk Hudson replaces Nicky Adams. 58:09 Stephen Dawson crosses the ball, save made by Richard Lee. 57:54 Paul-Jose M'Poku decides to take the corner short. 57:19 Jimmy Smith is flagged offside by the assistant referee. Richard Lee takes the indirect free kick. 57:14 Centre by Stephen Dawson. 57:00 Paul-Jose M'Poku takes a shot. Leon Legge gets a block in. 56:07 Matthew Spring crosses the ball. 54:28 Paul-Jose M'Poku takes a inswinging corner from the left by-line to the near post, save by Richard Lee. 54:17 Shot from 12 yards by Matthew Spring. Blocked by Pim Balkestein. 50:50 James Walker challenges David McCracken unfairly and gives away a free kick. Free kick taken by Richard Lee. 48:49 Centre by Sam Wood. 46:00 Nicky Forster takes a shot. Aaron Brown gets a block in. 45:00+1:10 The match has reached half-time. 44:13 Free kick awarded for a foul by Elliot Omozusi on Nicky Adams. Nicky Adams takes the free kick. 44:13 Booking The referee books Elliot Omozusi for unsporting behaviour. 43:14 Corner taken right-footed by Nicky Adams from the left by-line to the near post, clearance by Jimmy Smith. 43:01 Sam Wood produces a cross, Nicky Forster takes a shot. Save by Lee Butcher. 42:23 A cross is delivered by Elliot Omozusi, save by Richard Lee. 41:51 Unfair challenge on Stephen Dawson by Gary Alexander results in a free kick. Ben Chorley restarts play with the free kick. 41:18 Matthew Spring sends in a cross, Stephen Dawson has an effort at goal from just outside the area which goes wide of the left-hand post. 40:50 Aaron Brown fouled by Nicky Forster, the ref awards a free kick. Ben Chorley takes the free kick. 39:21 The ball is crossed by Sam Wood. 38:25 Ryan Jarvis gives away a free kick for an unfair challenge on Leon Legge. Direct free kick taken by Richard Lee. 35:18 Free kick awarded for an unfair challenge on Gary Alexander by Terrell Forbes. Strike comes in from Sam Wood from the free kick, save made by Lee Butcher. 33:53 Nicky Forster is flagged offside by the assistant referee. Indirect free kick taken by Lee Butcher. 32:28 Nicky Adams produces a cross, save by Lee Butcher. 32:03 Nicky Forster fouled by Aaron Brown, the ref awards a free kick. Free kick taken by Craig Woodman. 30:59 Free kick awarded for a foul by Aaron Brown on Gary Alexander. Sam Wood produces a cross, Headed effort on goal by David McCracken from inside the penalty box misses to the right of the target. 30:31 Stephen Dawson has an effort at goal from outside the area which goes wide right of the goal. 30:01 Inswinging corner taken by Paul-Jose M'Poku from the left by-line. 29:50 The ball is delivered by Elliot Omozusi, Leon Legge makes a clearance. 27:48 Gary Alexander handles the ball and concedes a free kick. Indirect free kick taken by Aaron Brown. 27:11 Paul-Jose M'Poku delivers the ball, clearance by Nicky Forster. 26:05 Centre by Pim Balkestein, Effort from inside the six-yard box by Nicky Adams goes wide left of the target. 24:20 Paul-Jose M'Poku crosses the ball, Ryan Jarvis takes a shot. Save by Richard Lee. 21:51 Nicky Forster takes a shot. Save by Lee Butcher. 21:31 The referee blows for offside. Craig Woodman takes the free kick. 18:56 Nicky Forster gives away a free kick for an unfair challenge on Elliot Omozusi. Lee Butcher takes the free kick. 17:25 Craig Woodman challenges Ryan Jarvis unfairly and gives away a free kick. Free kick crossed right-footed by Paul-Jose M'Poku. 16:19 Gary Alexander is ruled offside. Free kick taken by Lee Butcher. 14:45 Nicky Forster sends in a cross, clearance by Stephen Dawson. 13:22 Jimmy Smith crosses the ball, clearance made by Craig Woodman. 13:15 The ball is crossed by Paul-Jose M'Poku, clearance made by Marcus Bean. 12:09 Effort from deep inside the area by Nicky Forster misses to the right of the target. 11:17 Ben Chorley challenges Gary Alexander unfairly and gives away a free kick. Gary Alexander takes the free kick. 9:26 The official flags Ryan Jarvis offside. Indirect free kick taken by Craig Woodman. Correction - 8:19 Foul by Jimmy Smith on Marcus Bean, free kick awarded. David McCracken takes the direct free kick. 8:19 Unfair challenge on Marcus Bean by Jimmy Smith results in a free kick. David McCracken takes the free kick. 7:26 Ryan Jarvis is flagged offside by the assistant referee. Richard Lee takes the free kick. 5:33 Elliot Omozusi fouled by Marcus Bean, the ref awards a free kick. Strike on goal comes in from Ryan Jarvis from the free kick. 5:26 Centre by Paul-Jose M'Poku, clearance by David McCracken. 5:01 Paul-Jose M'Poku delivers the ball, clearance by Sam Wood. 4:42 Paul-Jose M'Poku crosses the ball, Toumani Diagouraga manages to make a clearance. 3:49 Shot from just outside the area by Paul-Jose M'Poku goes over the bar. 2:40 The ball is swung over by Elliot Omozusi. 2:33 Paul-Jose M'Poku produces a cross. 2:16 Short corner taken by Paul-Jose M'Poku. 1:03 Inswinging corner taken left-footed by Sam Wood from the right by-line, save made by Lee Butcher.